A GLOBAL CORPORATE. A GLOBAL BRAND. With innovation at the core of its philosophy, the New Delhi (India) headquartered Hero MotoCorp has been at the forefront of designing and developing technologically advanced motorcycles and scooters for customers around the world. It became the world’s largest two-wheeler manufacturer in 2001, in terms of unit volume sales in a calendar year, and has maintained the coveted title for the past 18 consecutive years. With over 85 million satisfied customers across the globe, it continues to champion socio-economic progress and empowerment through its range of products and services. Led by Dr Pawan Munjal, Chairman, Hero MotoCorp, it has taken rapid strides to expand its presence to 37 countries across Asia, Africa, and South & Central America. Hero MotoCorp is a truly global enterprise with a workforce that comprises of people from different nationalities including India, Bangladesh, Colombia, Germany, Austria, Japan, and France. Hero MotoCorp is the dominant market leader in India – the world’s largest two-wheeler market – with over 50% share in the domestic motorcycle market. The state-of-the-art, world-class Center of Innovation and Technology (CIT) at Jaipur, in the northern Indian state of Rajasthan, is the global hub of Hero’s Research and Development. The CIT has more than 700 engineers from across the world that are engaged in developing the new range of mobility solutions for customers across the globe. 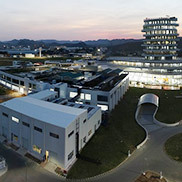 The sprawling one-of-its-kind, world-class R&D Center houses the best global facilities for product design & development, testing, and validation under one-roof. With an objective of building a robust R&D ecosystem that is spread across global geographies, Hero MotoCorp has also set-up the ‘Hero Tech Center Germany GmbH’ at Stephanskirchen, near Munich. 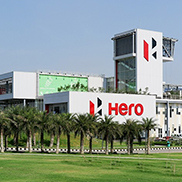 A wholly owned subsidiary of Hero MotoCorp, the Hero Tech Center in Germany focuses on the development of new vehicle concepts and future technologies in close cooperation with the teams at CIT in Jaipur. 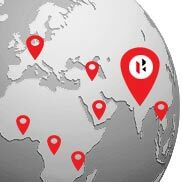 As part of its technology ecosystem, Hero MotoCorp also engages with top global design and technology houses from across the world, including Italy, Spain, and Thailand. In keeping with the diverse demography of customers in different geographies of the world, the Company is developing market-specific products to suit every customer need. Hero MotoCorp’s manufacturing facilities are based on the core principle of sustainable development, as the Company remains committed to maintaining the highest ecological standards. Hero MotoCorp has seven globally benchmarked manufacturing facilities, including five in India and one each in Colombia and Bangladesh. In India, the facilities are located at Dharuhera and Gurugram in the northern Indian state of Haryana; at Haridwar in the hill state of Uttarakhand; at Neemrana in the northern state of Rajasthan, and at Halol in the coastal state of Gujarat in western India. The facility in Colombia is located at Villa Rica in Cauca province and at Jessore in Bangladesh, situated in the southwestern region of the country. It became the only Indian two-wheeler company to set up a manufacturing base in Latin America when it started operations at its manufacturing facility at Colombia in 2016. Hero MotoCorp currently has an annual combined production capacity of around 9 million units of two-wheelers. The Company’s manufacturing facilities at Neemrana and Halol have been aptly called the ‘Garden Factories’, for their various measures, which have redefined green manufacturing. The new manufacturing facility of Hero MotoCorp is coming up at Chittoor, in the southern Indian state of Andhra Pradesh. As a responsible corporate citizen, Hero MotoCorp has always gone beyond its business objectives to ensure a green, safe and happy environment for the society at large. Its efforts continue to bring about noticeable improvements in the lives of hundreds of thousands of people. Hero’s Corporate Social Responsibility (CSR) platform revolves around three flagship initiatives – the ‘Ride Safe’ program, empowerment of the girl child, and the ‘Happy Earth’ program for the environment. The Company’s Ride Safe program, which has been recognized by the Ministry of Road Transport and Highways of the Government of India, has seen participation from over 100,000 people, including students, teachers, police personnel and Hero customers. The ‘Hamari Pari’ (Our Angels) program, which recognizes the ability of girls to become agents of social change, has already benefited over 100,000 adolescent underprivileged girls through financial assistance, motivational sessions, and guidance camps. The ‘Happy Earth’ program aims to protect, conserve, restore and optimally use environmental resources through various initiatives including tree plantation drives, water conservation programs and conservation of wildlife. Additionally, under its Community Care Program, Hero has been engaged in the socio-economic development of more than 100 villages in several parts of India through various initiatives including skill development of the youth, promotion of sports, health camps and water harvesting projects. Hero MotoCorp is one of the largest corporate promoters of multiple disciplines in sports across the globe. Driving innovation in sports to attract new audiences, Hero MotoCorp has been associated with Golf, Football, Field Hockey and Cricket for over two decades now. Hero MotoCorp is the biggest corporate promoter of Football in India, supporting the game across all platforms. In addition to being the Sponsor of the Indian national teams for men and women across all age groups, Hero is also the Title Sponsor of all the major domestic leagues - The Hero Indian Super League, Hero i-League, Hero i-League for women, Hero Super Cup, and the Hero Intercontinental Cup. Hero was also the National Supporter of the FIFA Under-17 World Cup 2017 hosted in India. Argentinian football legend and the coach of Atletico Madrid team – Diego Simeone – is Hero MotoCorp’s Brand Ambassador. Hero MotoCorp is committed to promoting and popularizing Field Hockey in India and across the world. Hero was the Title Sponsor of the Men’s Hockey World Cup held in New Delhi in 2010 and also supported the men’s Hockey World Cup held in Odisha in 2018. Hero continues to be a long-term partner of the International Hockey Federation (FIH). Over the years Hero has also partnered with major Hockey leagues held in India – Hero Hockey India League, Hero Hockey Champions Trophy, and Men’s Hockey World League. Additionally, Hero was also the Title Sponsor of Men’s Asia Cup 2017 and 2018 Asian Champions Trophy. Hero MotoCorp has had a long association with Cricket in various capacities. Hero was earlier one of the Global Partners of the International Cricket Council (ICC). It was the team sponsor of Delhi Daredevils and later Mumbai Indians teams in the Indian Premier League (IPL) T20 tournament and was also a partner of the IPL at the central level. The Company is currently the Title Sponsor of the Hero Caribbean Premier League – the highly popular T20 Cricket tournament held annually in the Caribbean islands and the USA. A host of top Indian men and women cricketers are Hero’s brand ambassadors. Hero MotoCorp has been associated with Golf for over two decades and is currently a partner of all three prominent tours – The Asian Tour, The European Tour, and the US PGA. It hosts the ‘Hero Challenge’ - innovative one-hole knockout contest played under lights, at three major European Tour events. The Hero Challenge is a much sought-after engagement for players, celebrities and fans alike. 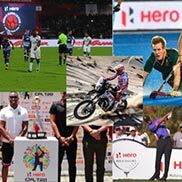 Hero MotoCorp also hosts the ‘Hero World Challenge’, at Albany in the Bahamas, a PGA sanctioned Tiger Woods invitational event. The Company also hosts the marquee Hero Indian Open, for men as well as women. It has been the title sponsor of Hero Indian Open for men, co-sanctioned by the Asian Tour and European Tour, since 2006 and the Hero Women’s Indian Open, which is a part of the Ladies European Tour, since 2010. Hero MotoCorp also sponsors India’s domestic Pro Tour for women. Golfing legend and 14-time major winner Tiger Woods is Hero’s Global Corporate Partner. Top Indian golfers such as Anirban Lahiri, Shiv Kapur, Sharmila Nicollet, and Tvesha Malik are also brand ambassadors of Hero MotoCorp. Hero MotoSports Team Rally, the rally-racing team of Hero MotoCorp, has become a flag-bearer of Indian motorsport on the global arena. The Team has consistently delivered impressive performances across the world, including the world’s most challenging ‘Dakar Rally’. The Team’s three riders – CS Santosh from India, Joaquim Rodrigues or JRod as he is popularly known from Portugal and Oriol Mena from Spain – have given a string of good results over the past three years. While Oriol finished at the 7th and 9th positions in 2018 and 2019 respectively, JRod finished the Dakar Rally 2017 and 2019 in the 12th and 17th positions respectively. CS Santosh finished Dakar 2017 at 47th and Dakar 2018 at the 34th position. A truly global automotive player with an ever-expanding customer base across continents, Hero MotoCorp remains committed to designing and developing eco-friendly mobility solutions for the world. The Company has set new benchmarks in green manufacturing and sustainable practices, while its social responsibility initiatives continue to enrich society.